A student enrolled in the agriculture program is exposed to the growing, marketing, and care of a multitude of ornamental and food crops as well as the different facets of the food, fiber, and natural resource industry. As a prospective agriculturalist, the student studies all aspects of plant science, greenhouse management, sustainable horticultural technology, landscaping, soil science, turf grass management, and forestry as it pertains to the industry. Basic mechanical skills such as carpentry, electricity, plumbing, small gas engines, masonry, and equipment operation are also taught in the agricultural program. In addition, students will learn introductory animal science as it pertains to our aquaponics system and chicken flock that we raise. A student entering the agricultural field should have a love for plants, the outdoors, and a willingness to develop their potential for premier leadership, personal growth and career success through the Columbia-Montour A.V.T.S. FFA. 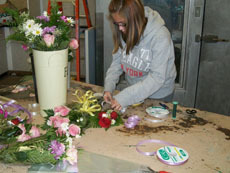 The agricultural program includes an agricultural mechanics shop, potting room, two computerized greenhouses, computerized drafting & design room, landscape nursery and a regulation putting green. Floral orders such as weddings, table arrangements, proms, and alter vases are performed throughout the year as they arise. Crops such as poinsettias, lilies, various vegetables, herbs, and 32 different varieties of bedding plants are grown and sold out of the two spacious greenhouses in addition to our raised garden beds. Golf course management is taught on our 3,500 square feet regulation putting green. Because the program teaches so many aspects of agriculture, it lends itself to the student that may not know exactly which career path they would like to travel. The prospective student should be a science-minded individual that loves working with nature. Good vision, manual dexterity, stamina, and the ability to work in various weather conditions are the primary qualifications for this occupation. The prospective student should be interested in working with plants, flowers, shrubs and learning about their growth and maintenance. The student should like to work outdoors or in greenhouses and have the ability to handle machinery necessary to create and maintain grounds and landscaping. The agricultural industry is a thriving, innovative, fast-paced field which will need many new employees to meet the challenges that face our growing society. Agriculture is the number one industry in Pennsylvania and horticulture plays an important part. Cosmetology is the art and science of improving beauty through care and treatment of the hair, skin, and nails. The cosmetology course is designed to teach students to develop pride in their personal appearance and to prepare them to become competent cosmetologists. 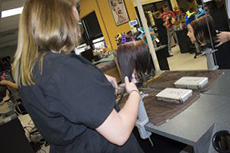 A major objective of this three-year program is the preparation of students for licensure to practice cosmetology in the Commonwealth of Pennsylvania upon graduation. You should have an interest and desire to serve others. As a cosmetologist, you should have a pleasing personality, good grooming habits, and personal hygiene, coupled with an interest in the most current hair fashions. You will be required to stand for long periods of time and should have good finger and manual dexterity, as well as good color and style perception. 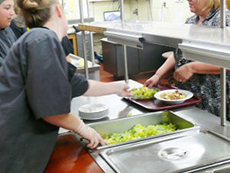 This program uses the ProStart® nationwide, two-year program for high school students. ProStart’s industry-driven curriculum provides real-world educational opportunities and practical skills to open doors for fulfilling careers in the restaurant and foodservice industry. The curriculum teaches all facet of the industry, as well as provides students with on-the-job experiences where they can apply their classroom knowledge in real world situations. 5. Good Background in Basic Mathematics. This program is designed to prepare individuals to apply knowledge and skills in health careers. It is for students whose career objective is one within any technical health field. 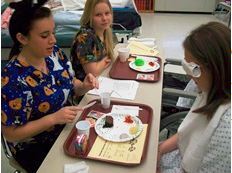 Instruction is provided in the basic skills in a variety of areas associated with health careers such as health and medical services, pharmaceutical and medical instruments and supplies. An opportunity to develop confidence and leadership skills is available through participation in SkillsUSA, a national vocational student organization. Common traits among health professionals include: excellent oral and written communication skills, emotional stability and maturity, competent computer skills, critical thinking skills, and the ability to pay great attention to detail. Math and science are also very important in most health careers. Students are expected to be compassionate, dependable, empathetic, respectful, and be able to work independently or as part of a team. 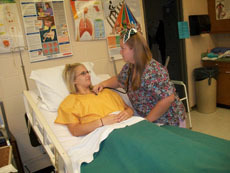 The Health Sciences program is designed to introduce students to various health careers, teach students skills which can be used to get jobs in the healthcare field, prepare students for further education in selected health careers, and make the transition from high school to the workforce or post-secondary education less difficult. Through this program, students may also participate in SkillsUSA, a state and national leadership organization specifically designed Career and Technology students. Through SkillsUSA, students have opportunities to develop self-confidence and leadership skills, students may also earn college credits through the Penn College NOW program. You should possess a genuine interest in people. Honesty, dependability, self-motivation, good grooming and attendance are essential attributes. You should also have a high degree of manual dexterity, a good math, science, and English background, good color perception, attention to detail, and the ability to interact well with other people. Computer skills are important in all areas of health care.